We are in the thick of the holiday season, and my fellow parents are beginning to post and pin funny, creative, and/or crazy Elf on the Shelf poses. And then I happened upon this article on my Twitter feed, which made me laugh. 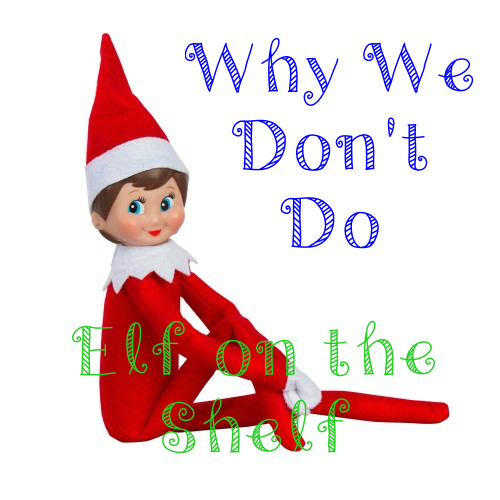 I was asked by a fellow parent at my son’s school about starting Elf on the Shelf this Christmas season since 3 year olds seem to understand more. I told the parent that we don’t plan to do Elf on the Shelf, which brought a surprised reaction. Aside from having to remember to move that darn thing every night, I personally believe that the holidays are about giving and being grateful. What do you mean you ask? Well, Elf on the Shelf is basically a spy for Santa to report good and bad behavior. I expect my children to be on their best behavior always. And while it is great to have that extra reinforcement at home watching my children trying to be good, what happens after the holidays? Is the expectation that now the spy is gone so does good behavior? Every day, when I pick up my son from school, I always ask him if he’s been a good or bad boy. Right now this conversation is my son saying he was good because he either took a nap during nap time, was quiet during nap time, or was a bad boy because he was loud during nap time. Every morning we talk about what behavior we expect from him to be a good boy, which means listening to mommy, daddy, and other adults; being nice to his peers and sister; learning to share (something he has difficulty with because of his baby sister); and napping/quiet time (we all need our toddlers to nap!). Every day we emphasize that he should be a good boy. I think an Elf watching him might be overkill. You are probably thinking, “But isn’t Santa the same thing as the Elf and you make your kids see Santa!” Well, yes and no. Yes, we read stories about Santa and how he gives toys to good children and sends bad children coal–but I don’t emphasize that. When my son visited Santa this year and we were waiting in line, there was a lot of talking and prepping. We talked about if my son believed he was a good boy this year and what he wanted. But we also talked about how it would be nice to give Santa a present too. My son and I talked and laughed about what we could make for Santa for Christmas. When it was my son’s turn to visit Santa, he quietly said that he would like [magnetic] letters and then he asked what Santa wanted for Christmas. Santa naturally said that he would like some cookies and milk of course. This year I also took my son out shopping with me. I told him that he needed to give presents to people in the family to show he appreciated them and cared. And being the toddler that he is, we spent ages (OMG, an hour at the toy store!) trying to find the perfect presents for family. He made sure the colors were right since that was most important to him. And though I know he doesn’t quite understand this concept, I talked about the less fortunate people in the world. We all know of the Salvation Army bell ringers, and he noticed and asked about it this year. I explained that the bell ringer was collecting money for the poor and that if we have any spare money we should give. And so I gave him a few coins to throw in the pot, which he enjoyed doing. He also enjoys doing this during Labor Day when the firemen are out on the street with their boots collecting money for Jerry’s Kids. When he gets older we are going to start doing formal volunteering (I guess this is the social worker in me). So we don’t do Elf on the Shelf. I think it’s a great idea. But I want my children to focus on giving and eventually giving back.